When planning a new setup we always strive to create a natural looking aquarium that is easy to maintain. If you can get these four principles to converge, you are well on your way to having set your self up for a successful aquarium and healthy fish. The reason it works well is that the dirt is directed to the filter. In the filter it can be acted upon and removed upon cleaning. 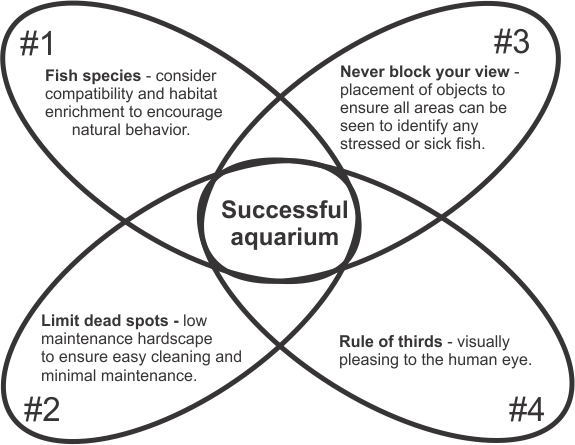 Four design principles to set yourself up for a successful aquarium. #1 It`s an excellent idea to know which fish you are planning to keep and ensure the environment will stimulate them. This goes a long way to creating a level of habitat enrichment. For example, a sandy substrate for fish which like to burrow and lots of algae for fish which like to scrape it off of the rocks. To achieve this we can use use a fine sand and rock towers that are close to the surface of the light. The higher light intensity will provide all the algae needs. We use marine lights on our Mbuna tanks. The blue light allows green algae to flourish. All you have to do is scrape the algae of the glass. Find out more about our range of LED lights. #2 An excellent tip is to place rocks to help the moving water to guide dirt and debris towards the filter. This can be achieved in large tanks with the use of low wattage directional pumps (highly recommended). Limiting dead spots is the number one goal to ensure a low maintenance aquarium. #3 When placing rocks, never block your view into caves and crevices. Ensure entrances are front facing to prevent a stressed fish going to ground and not being seen. Prevention is far easier than curing a sick fish. This is especially true for species prone to intestinal bugs (Malawi Bloat). #4 Finally we want to end with something which is visually pleasing. When we create a hardscape we try to use the rule of thirds and never place our focal point in the center, rather off setting it to one side. I also find using rocks and sand that come from the same area look more natural. The rule of thirds is a guideline in art and photographic composition. It's based on the theory the human eye would naturally gravitate to points which intersect when the canvas is split into thirds. Long story short, this idea is speaking to the subconscious part of your brain. If you set the aquarium out with the focal points (rocks and logs) bisecting the imaginary thirds it will feel more natural and pleasing. A visual example is explained further in the video below. When building caves such as the ones featured in the video make sure you perform regular housekeeping duties (syphon out debris). Habitat enrichment is a keystone principle in providing the best possible environment for your fish. Habitat enrichment is a keystone principle in the requirements to become an AZA accredited zoo and aquarium. The AZA has defined enrichment as a process for enhancing animal environments within the context of the behavioral biology and natural history. I know its easy to scoff and say "what can you do for a captive bred specimen which has never seen the wild". The answer is that instinctive behavior does not diminish. Researching the fish you plan to keep goes along way to helping you, help them. Habitat enrichment can be as simple as placing a piece of driftwood into an aquarium which houses Panaque catfish. To see their natural behavior of eating the wood in your aquarium is one of those fine pleasure associated with fish keeping. After all, is it not a slice of nature that we are striving for? Ensuring the correct substrate, decor and water movement are the first steps in habitat enrichment. Using safe live foods to inspire hunting behavior and growing algae on rocks which can be placed in the aquarium will provide further enrichment. We use a small square of Poret foam with mini pellets dropped inside to encourage fish to forage, rather than just getting food, they have to work for it. The Altolamprologus calvus use their long snout to get out the tidbits.